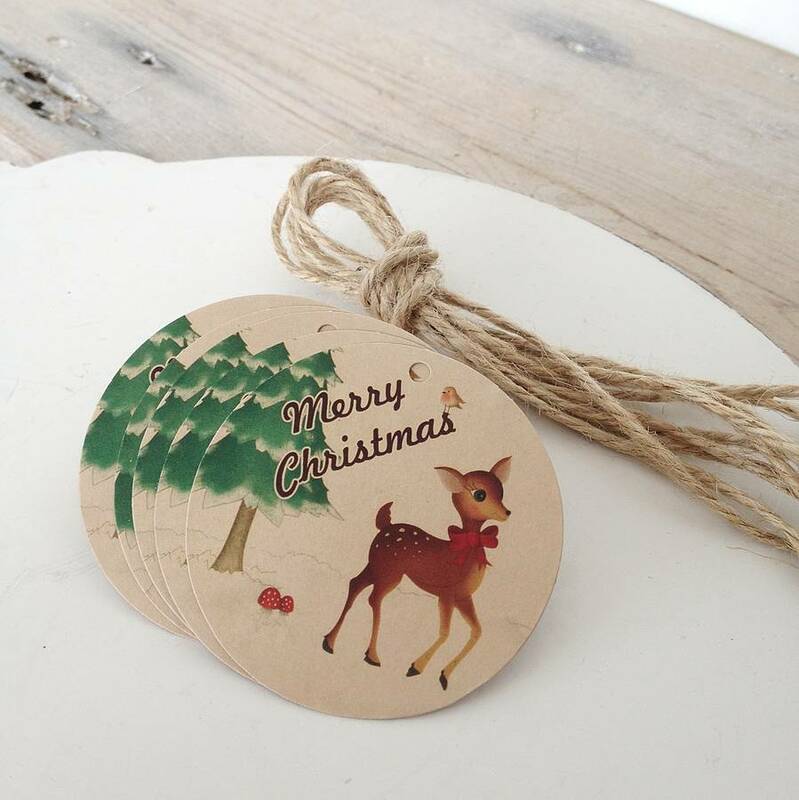 A cute retro-styled Christmas gift tag, featuring a vintage effect illustrated woodland deer. The only tags to be seen under the tree this Christmas. This beautiful recycled card gift tag features a print of a retro festive forest, with toadstools and a robin. The perfect choice for your Christmas wrapping. 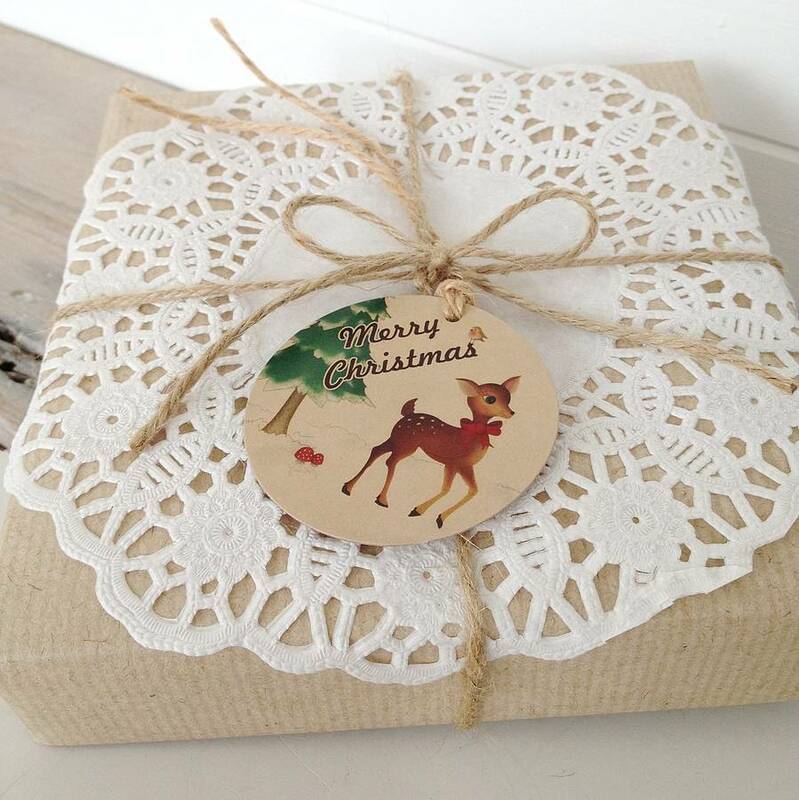 Team the tags with brown paper and string for a rustic look, or with beautiful deep reds, greens or golds. Gingham ribbon also looks amazing with these cute labels. Each tag has a hole in it ready to be finished with the supplied rustic twine. The reverse of each tag is left blank so that you can write a message of your choice. These tags can be bought in multiples of five, ten, fifteen or twenty (supplied in packs of five). Your tags will come packaged in packs of five in a cellophane wrapper to protect them from dust and dirt, sealed with a 'Cherry Pie Lane' sticker. The tags are supplied with five lengths of rustic twine for you to thread through the holes. The tags are printed on 315gsm recycled manila board and is an original digital scrapbook illustration by Charlie. Rustic twine lengths. Packed in a cellophane bag. Each card measures approx. 6cm dia.